We're smack in the middle of Los Angeles' acclaimed restaurant week, and for those of you in Southern California through January 25, a bevy of eateries are participating in dineLA. This is an event where participating restaurants craft an exclusive menu, lunch or dinner, that best represents them — just at a fraction of their regular prices. For those who participate in dineLA for the adventure, and want to venture away from the more traditional dishes you can find at most restaurants, you're in luck. We discovered nine innovative dishes that have piqued our interests this season. Check them out below. As with most cases during dineLA week, reservations are highly recommended. Found at A Frame, this Cracklin' Chicken combines the moistness that comes from beer can chicken with the rich, bold flavors that can only be found at this Hawaiian Soul Food spot. With a beauty like this, it's no wonder this chicken item has become one of A Frame's signature dishes. Made with dulce de leche and vanilla bean gelato, Art's Table is serving up this sweet rendition of bread pudding made from croissants as part of their dineLA menu. Croissant Bread Pudding checks off a lot of the boxes for anyone with a sweet tooth. A dry-aged steak is an experience that beef lover should have once in their life. APL Restaurant is serving a ribeye that's been dry-aged in the restaurant's famous 1,000 square foot chamber. Man, imagine the flavor waiting to be unlocked within that steak. The duck confit fries from Belcampo are one of the best fries I've had the privilege of trying in Southern California. Belcampo takes them to a new level by throwing in crispy duck leg confit, duck gravy, and white cheddar. Fans of hard shell tacos can find Blue Plate Oysterette's Lobster tacos stuffed with Maine lobster, shredded lettuce, jalapeños, and drizzles of a "cheesie" sauce and truffle oil. A huge departure from the hard shell tacos I enjoyed in college, but a welcome one. There was a time when throwing lobster on a pizza was unheard of, but Cattle and Claw's took their shot and it looks delicious. This may be the first pizza I wouldn't dunk in ranch dressing. The key to a solid bowl of ramen is a rich broth, and Hinoki + The Bird's Lobster Ramen does not shy away from that. This decadent dish features butter poached lobster swimming in a seafood broth and hand-made ramen noodles. I haven't been a fan of longanisa sausage for long, but since trying it, the Filipino ingredient has become too delicious to quit. 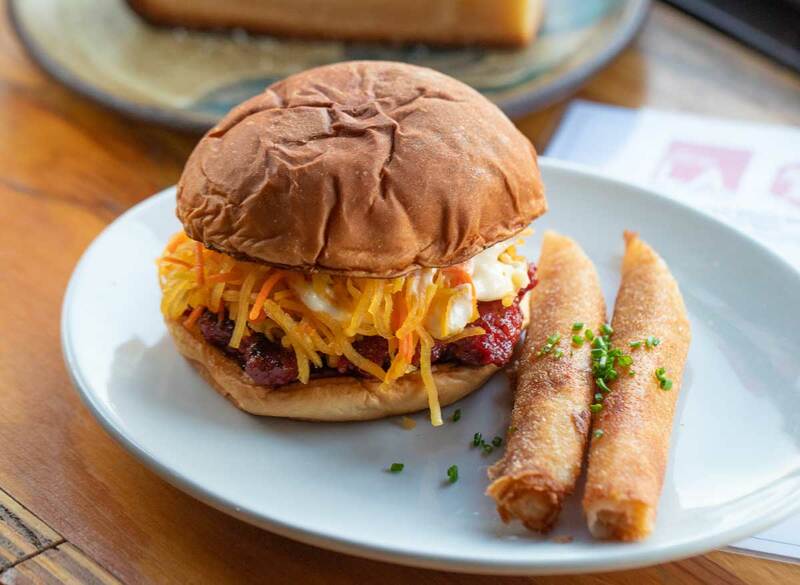 Ma'am Sir's Longanisa Burger serves up an entire patty filled with those juicy Filipino flavors. Wonder if I can request a double patty here? Fans of the Impossible Burger will want to check out Mohawk Bend's Big Mohawk, a meatless play on McDonald's prolific Big Mac Sandwich. It features two vegan Impossible Meat burger patties, shredded lettuce, vegan American cheese, pickles, onions, and special sauce on a sesame seed bun.